II recieved this in exchange for writing an unbiased review of the product through a program StartTech.com has. A little background information is necessary. I used a Google Pixel as well as a Samsung S8 for primary reference points when writing this. IN addition I used a Creative Labs Audio Booster, a Logitech Sub and two Satellites and a Logitech unifying reciever with a few different keyboards although to prove a point, I ended up snapping a picture with a standard USB Keyboard and Mouse. The reason I bring up the phones is that until recently, all of our non iPhone wireless devices used one of the older USB charging protocols. I am the Director of Data Science at one of the nations largest Wireless device warranty companies. Before joining, I used to think the extra money spend on Apple chargers was silly but since learned that's far from the case. I had no idea how many phones exploded every day. The 3-Port USB-C Hub operates as a traditional hub but it also has the ability to charge devices. Wanting to give StarTech their money's worth, I asked one of our techs to look at the consistency the device put out and while I'm not an engineer, I understand enough to know that the fluctuations we saw were no greater than those you'd see if you randomly sampled 5 or 10 Apple chargers. I didn't have 5 of these to do a true comparison with but when we've done the same with off brand discount chargers, the fluctations per chord is high, try doing it with a sample and look at the deviations and it's no wonder the problem is as pervasive as it is So you can use it as a very reliable charger for your C devices and unless all of your tech is brand new, chances are you're going to have some mixture of USB classes. So what does it take to get up and running with this little wonder? The walk to your mailbox is probably the most compliicated endeavor in the entire process. Open the box (and StarTech shoudl win a humanitarian aware of some sort for thei packaging - apparently one of the folks there decided that making customers exert the same amount of effort it'd take to blown open an Armoured vehicle wasn't a good idea and opted for simplicity. Once you unbox it, you plug it into the charging port of your phone. From there, there's one C port available and 3 A Ports. I included a picture for this one but if I have time I'll reocrd both audio and video to give you a feel for how well it performs. It's such a simple little device. It's light yet well built and for some reasons reminds me of car doors once the auto industry decided usability and quality mattered. Prior to that car doors were always heavy, they seldom felt like they closed with much precision and the handles were quick to break. Then after the quality revolution, details like doors closing and door handles operating correctly became a big issue. While that's a total digression I included it b/c that's the same feeling I got here. It's sturdy, everything fits snugly without any unnecessary leeway (you know that leeway, the type you usually encounter before your device stops charging correctly unless you go to great lenghts to make sure the connection is made correctly) and although it's lightweight, it feels as though somone put a great deal of effort into making it so as opposed to just using cheap low end materials. I decided to review this device on a whim, it wasn't something I thought I needed and didn't really think I had a use for it. When I saw the charging features for USB C , it was enough to make me want to give it a try. Since them, I've found countless uses for it. I'll admit that each of the phones we use them for are the latest generation and are higher end devices but I love this little guy and I'm pretty sure you will too. Solid construction (the feed cable seems reinforced). Connected to Dell and Macbook (Pro with touchbar) and it just works without any extra steps. The power adapter is a nice touch as it allows for devices with a larger draw to be connected. File transfers from internal storage to a connected USB device, from a 2nd USB over the ethernet, and from the network to local storage over ethernet all at once and throughput was spot on. My only criticism is that the device won't work as a simple charging hub unless the USB-C is connected. Other than that, it's an ideal little device! I received this product in exchange for an unbiased review. 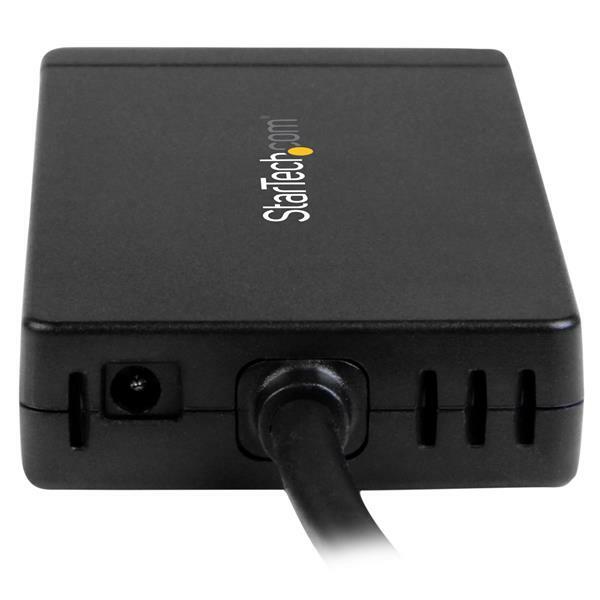 (5 stars) Great Mini docking station! 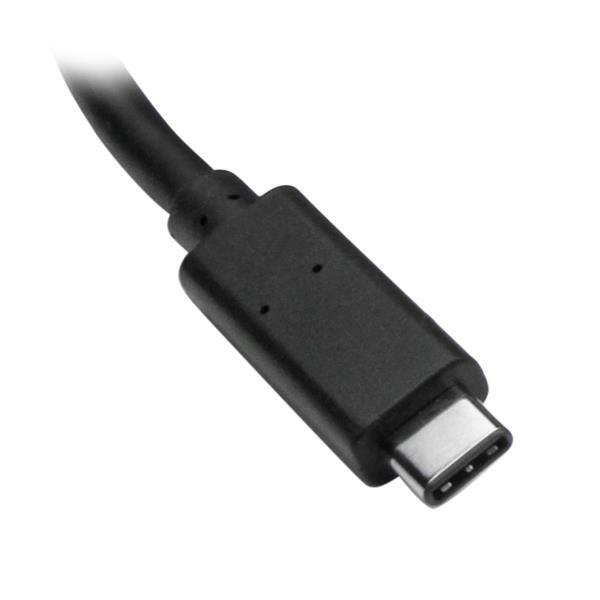 (5 stars) Expand by 3 USB Type-A and GB ethernet via USB-C! 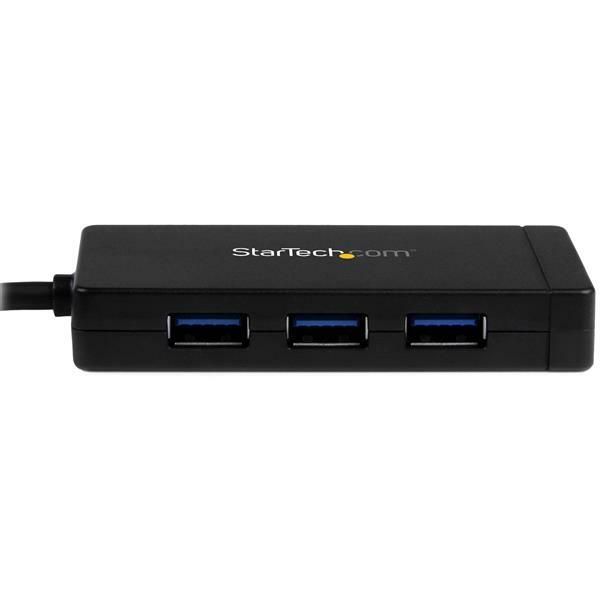 The Startech.com 3-Port USB 3.0 Hub plus Gigabit Ethernet is a must for the road warrior! 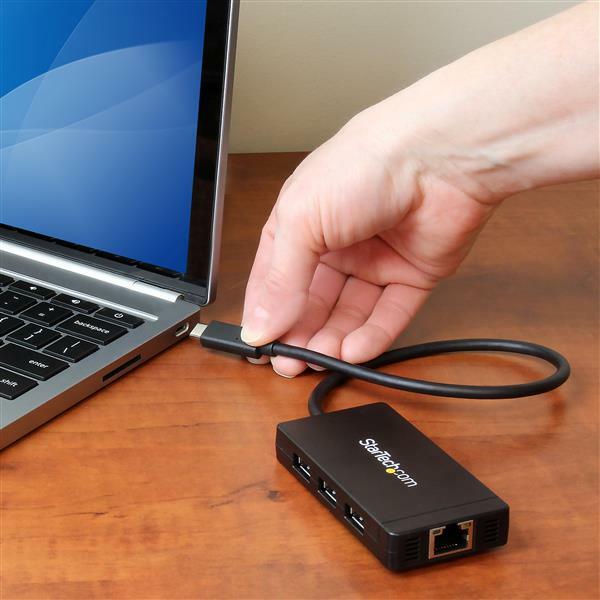 By using a USB C port you can expand your workspace with three USB 3.0 Type-A ports plus add gigabit Ethernet to your device! 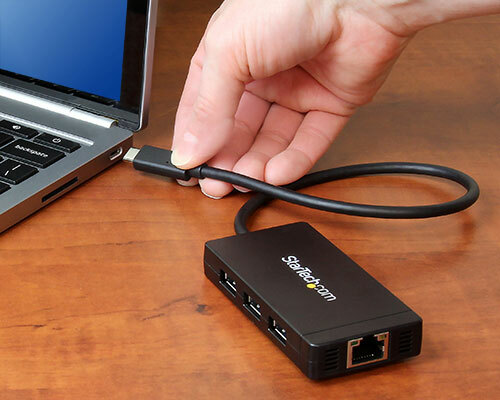 Having access to USB 3.0 is fantastic which means faster data transfer rates using an external hard drive, thumb drive or hard drive dock (all devices must be USB 3.0 to take advantage of faster transfer rates) just to name a few. 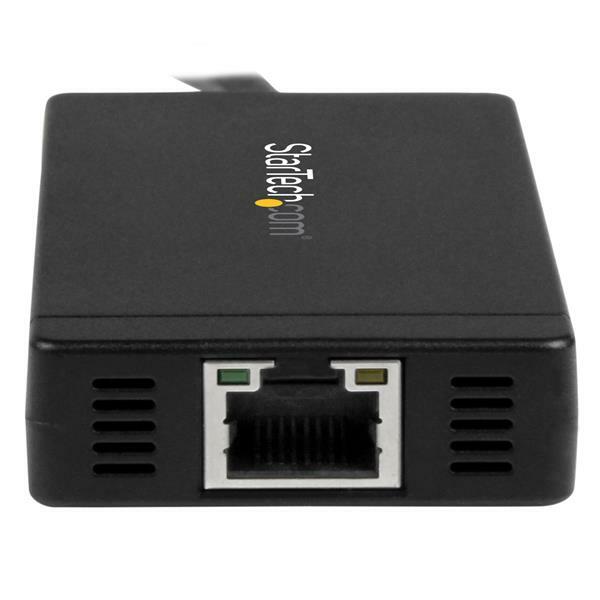 Coupled with this is the gigabit ethernet port which is a must when moving large amounts of data across a network. With all of these feature packed into a light weight device it is a must to be part of anyone's toolkit. In the box is the hub and the required power adapter. Another great product from Startech.com! I received this product in exchange for an unbiased review. I find this to be a very good product. It is compact and stylish. It is not a plug and play device though. You will have to go on StarTech's website to download and install the current drivers for this product for it to be functional. 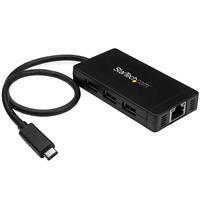 Once you have successfully installed the drivers then the Gigabit Ethernet port and powered USB ports become active. 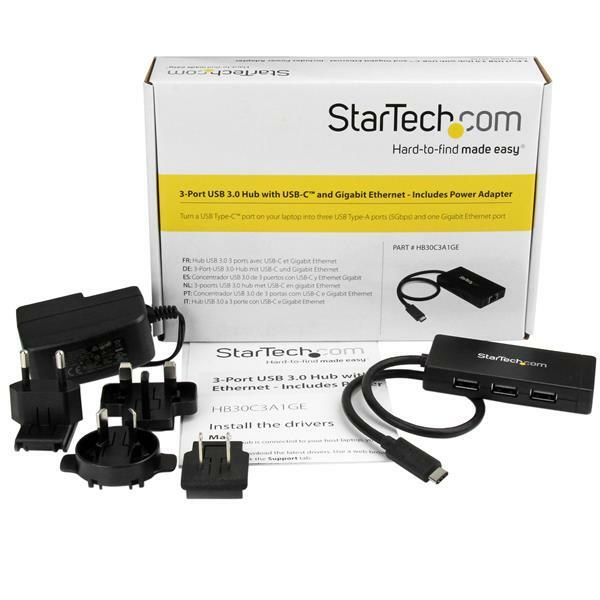 I do like that StarTech includes universal power adapters for international travel.